Beijing Auto gets all rights to the current Saab 9-5, which will be made in China. MUNICH -- Saab believes that a deal it announced today to sell some valuable but non-essential assets to Beijing Automotive Industry Holdings Co. is a major step toward its ultimate goal of finding a new owner. The money-losing unit of General Motors Co. will give the Chinese automaker all rights to the current 9-5 as well as some technologies from the 9-3 for an undisclosed amount. “The money (from the deal) will finance the new Saab and contribute to a good start under new ownership," Saab spokeswoman Gunilla Gustavs said. Separately, Saab continues to negotiate with potential buyers that are interested in taking over the brand and its remaining assets from GM. "We're confident that a deal will get done," she said without elaborating on the talks. Spyker Cars NV is negotiating to buy Saab, the Dutch sports car maker's CEO told Reuters on Sunday. Spyker is considered the front-runner to get the automaker, which GM wants to sell before the end of the year. Spyker boss Victor Muller said a deal with BAIC would be "good news" for his Dutch company because it involved assets that he described as equipment for old Saab models. Analysts, however, wonder whether Saab still has enough to offer a new owner. “This could lead to a slow and painful shutdown,” said a Europe-based consultant who asked to remain anonymous because he does business with both GM and Saab. A deal with Koenigsegg Group AB for Saab, which needs massive investment to update its models and reverse sliding sales, collapsed just weeks ago. As part of Monday's deal, BAIC, China's fifth-largest automaker, also gets the 9-5's tooling, which will be moved from Saab's plant in Trollhatten, Sweden, to China where Saab engineers will help BAIC integrate the technology into its future vehicles. BAIC does not currently produce cars under its own brand. The future Saab 9-5, which will share its platform with the Opel/Vauxhall Insignia, the 2009 European Car of the Year, is not part of the deal. Saab debuted the next-generation 9-5 at the Frankfurt auto show in September. Saab did not provide details on exactly what 9-3 technologies BAIC will get, however a company insider said it is not that much. The source declined to elaborate. 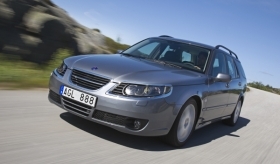 Saab will continue to produce and market the current 9-3 under its new owner. Added Gustavs: "There is nothing in the deal (with BAIC) that compromises our ability to develop new Saabs." Saab Managing Director Jan Ake Jonsson said in a statement: "This arrangement is excellent for both parties, now and for the future. We have developed a good relationship with BAIC and look forward to working with them to integrate this Saab technology into their future vehicles." Said John Zeng, an analyst with IHS Global Insight: "BAIC is one of the few major Chinese auto groups that still does not have its own car brand. Even though the Saab platform is old, it's still important for BAIC as it can finally get hold of something it can use later on for its own cars." Most Chinese automakers are either churning out foreign brand cars in tie-ups with global heavyweights such as Volkswagen AG and Toyota Motor Corp. or focused on the lower end, making cars as cheap as 30,000 yuan ($4,394). BAIC, which has joint ventures in China with Daimler AG and Hyundai Motor Co., is now on the same level as domestic rivals such as SAIC Motor Corp. and Dongfeng Motor Group, which have already rolled out cars developed based on acquired technologies or on their own. BAIC has made several aborted attempts to get access to foreign auto brands this year. Shortly after it dropped out of a race for GM's Opel brand, BAIC agreed in September to take a minority stake in Koenigsegg Group, a tiny group that includes supercar maker Koenigsegg Automotive AB, which struck a deal earlier this year to buy Saab unit from its Detroit owner. Last month, BAIC issued a state immediately after Koenigsegg Group's abrupt pullout from the talks saying it was reviewing its options while reaffirming its commitment to become more global. Its general manager, Wang Dazong, told reporters recently that BAIC might still be interested in Saab even though he saw no need to buy plants or robots. Sources told Reuters last week that BAIC has obtained a 20 billion yuan ($2.93 billion) line of credit from the Bank of China. "Money shouldn't be a major problem, the big challenge for BAIC and many other Chinese automakers is to come up with new models based on the acquired technologies," said IHS Global Insight analyst Zeng.